We’ve written a lot about how to send the right message at the right time. And while timing is important, how many messages you send also plays a role in your customers’ experience. If your customers feel they’re receiving too many messages, it’s not just about message volume. There’s more at play. 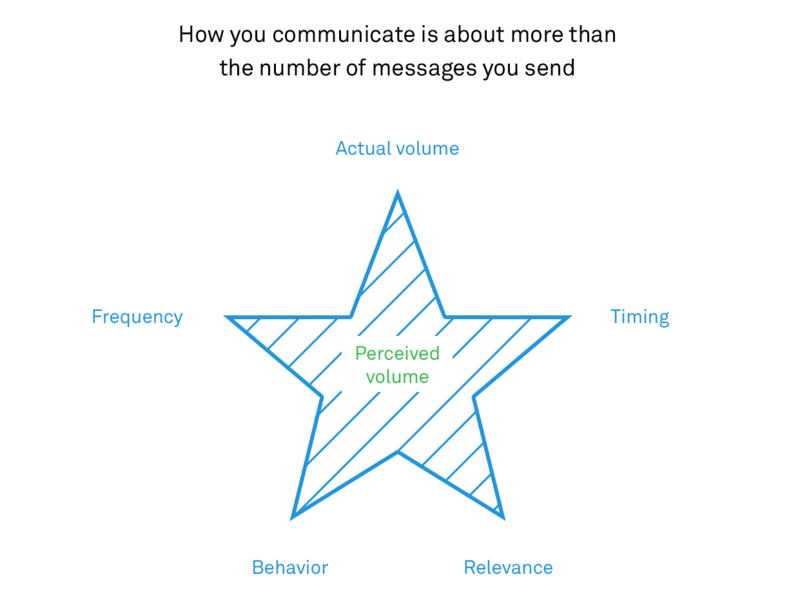 First, it’s important to note there’s a big difference between actual communication volume and perceived communication volume (i.e., the number of messages a customer feels they’re receiving). When it comes to perceived communication volume, there are five factors at play. Actual volume is just one. The other four? The problem is when you mess up some or all of the other four, volume is the first to get the blame. You need to make sure you get them all right. When you’re targeting the wrong customers, they will feel like it’s too much. As soon as you start targeting the wrong customers, they’re going to feel like it’s too much. When you get it right, you’ll see few complaints about “too many messages” and enjoy higher engagement rates all round. Luckily, staying relevant can be pretty straightforward. For example, only invite your new signups to your “getting started” webinar, don’t tell your customers in Europe about your Vancouver meetup and don’t encourage customers already on your pro plan to upgrade to your pro plan. Try to match your messages to relevant behaviors. Let’s say a customer shows intent in progressing with your product – for example, they have created their third playlist in your music sharing app. This customer is a great candidate to hear about your advanced playlist features. However, if you start telling customers who haven’t even created a playlist yet about this advanced feature, your message will just add to the noise. Closely related to behavior is timing. Sending a message to a customer about a feature they last used 10 days ago is useless and damaging. They’re unlikely to remember using it, unlikely to read your message and will probably feel you’re messaging them too much. However, messages sent immediately after a customer action come with context, which is critical for ensuring messages feel relevant. Sending three onboarding messages probably isn’t too much. Three onboarding messages sent all at once is. We regularly set our filters to a minimum of three days or longer between sending any given user a message. The aim of this is to keep frequency low and encourage communication with the customer. None of this is to say you can’t send too many messages. How many you send is entirely dependent on the individual business, user base and campaign in question. The key is to strictly limit the scope of your campaign to achieving one specific goal. The key is to strictly limit the scope of your campaign to achieving one specific goal. For example, your goal might be to activate new users inside your music sharing app. To be considered activated, you want them to listen to a song, create a playlist, and then share it. Limit your communication to talking about these specific actions, with each of the messages targeted and timed as accurately as possible. As you scale and have more teams doing and making more cool stuff, you’re going to be tempted to tell your customers about it all. Don’t talk about everything. Always err on the side of caution and if you’re ever in doubt, do less. Pick the most impactful reasons to talk to your customers and always be as targeted as you can. It’s also a great idea to have have just one person or team keep a close eye on your entire communication plan. Holistic governance is key to avoid overlapping and over-messaging. That person should monitor individual message and campaign performance very closely. If more users are upgrading, staying active, or whatever the goal was for your campaign, you’re doing something right. But move quickly to adjust or kill anything that isn’t performing. Lastly, talk to your customers about it. It’s the only way to truly understand perceived message volume. Listen to any complaints and react if you need to. Keep testing and iterating until you hit the sweet spot.